What does bowl cut mean? A bowl cut is a type of haircut that is the same length all the way around the head, forming the shape of an upside-down bowl. He’s typically seen riding a Razor scooter while sporting a goofy bowl cut and looking like an image ripped directly from an article on BuzzFeed about remembering the ‘90s. While the majority of models found themselves wearing wide-brimmed hats and scarves that completely covered their natural hair, nine were selected days before to get drastic cuts and dye jobs from Redken's Global Creative Director Guido Palau and Global Color Director Josh Wood. And by drastic, we're talking bowl cuts, mushroom tops, and retro rounded bobs, all black, save for wide swathes of lime green, fuchsia, teal, and more. Where does bowl cut come from? 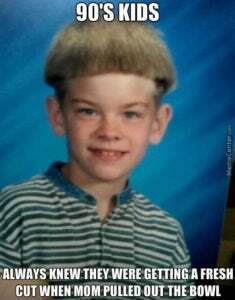 Bowl cuts are so named both because they give the appearance of an upside-down bowl on the head and because they are often created by actually placing a bowl on the head and cutting around it. It is this distinctive bowl shape that distinguishes the bowl cut from other short haircuts. Though hairstyles like the bowl cut have likely been around since amateurs have been styling hair, the first significant cultural meaning attached to the bowl cut dates back to Medieval Europe—though it wasn’t called bowl cut yet. The style was most commonly worn by soldiers, for practicality, and by monks and other religious figures, as a rejection of the worldly vanity associated with longer hair. Though the bowl cut went in and out of fashion throughout the Middle Ages, it continued to be associated with lower and working classes who could not afford to style longer hair. 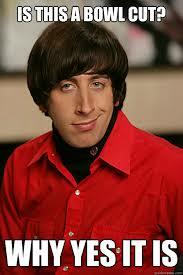 The bowl cut emerged again in the 1960s with British rock groups, most popularly The Beatles and The Monkees. Countercultural at the time, the bowl cut (referred to at the time as a moptop) opened the doors for the longer hippie hairstyles of the 1970s, the 1980s hair-metal trend, the preppy 1990s middle-parted bowl cuts of teen idols like Jonathan Taylor Thomas (JTT), Devon Sawa, and Nick Carter, the greasier 1990s and 2000s punk and emo cuts, and the Justin Bieber-inspired early 2010s combover. As a term, we can find written evidence for soup-bowl haircut in the 1940s, bowl haircut in the 1960s, and bowl cut by the 1990s. Though the bowl cut paved the way for popular hairstyles, today it is generally viewed as an embarrassing haircut. Characters in popular culture with bowl cuts are typically dumb or losers, such as Lloyd Christmas (Jim Carrey) from Dumb and Dumber or Coconut Head from Ned’s Declassified School Survival Guide. Despite this association with losers, bowl cuts retain some of their countercultural edge, with fashion-forward celebrities such as Rihanna and Kelly Osbourne sporting the look.